I like to think of all the lovely Poldark souls up there together, looking down on us and sending positive energy and good vibrations to the production team working on the new Poldark series. What a hoot they'll be having as they have their Poldark party in the sky ...... RIP Winston, gone but not forgotten! Tide was nearly full. Mist lay in a grey scarf along the line of the cliffs. .. and they walked home hand in hand through the slanting shadows of the new darkness. 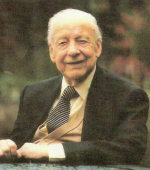 Winston Graham was a Fellow of the Royal Society of Literature and in 1983 was awarded the O.B.E. "A truly memorable and wonderfully talented author who because he so deeply understood, delicately explored and sensitively portrayed the intensely moving emotional depths of all of his characters so well, made it for many almost impossible not to become that character themselves. One of those rarest of authors too who possessing the most wonderful sense of the ridiculous and that of the deepest pathos meant reading into the small hours simply became the norm. But perhaps the true mark of his genius was not just one's constant need to read the books over and over again but to discover absorbingly new emotional avenues and responses every time. Year in and year out. A gentleman who whilst always sadly missed will happily always be fondly remembered through his many cherished legacies. Therefore with the determined help of our new Society, may his memory and his many books long continue to be celebrated and enjoyed by all of his legions of faithful readers and fans worldwide. Past, present and of course all those very lucky ones in the future. "Perfection is a full stop .... Ever the climbing but never the attaining Of the mountain top." W.G. It's because Ross's letter, typical of many similar ones necessary in wartime, strikes at the very heart of a family's core. In this case for the second time, perhaps even worse than Julia's death in some ways as Jeremy was buried far away in a foreign land, one of the many tragic personal consequences and therefore indictments of the futility of war made all the more compelling and absorbing by being written by the very Pied Piper of all Pipers himself, and which never fails to bring a lump to my throat every time I read it.